Left: Dan Waters adjusting the instrumentation on a thrust stand used for the testing of metal and ceramic micro-rocket engines. Right: Robert Vocke with his morphing wing wind tunnel prototype. Aerospace Ph.D. students Dan Waters and Robert Vocke III have recently been awarded the the Science, Mathematics And Research for Transformation (SMART) Scholarship. Originally from Massachusetts, Dan attended Boston University for his undergraduate studies in Aerospace Engineering. He has been a graduate research assistant at the University of Maryland under the guidance of Dr. Cadou since 2008. In 2011, he earned a M.S. in Aerospace Engineering with a focus in Aerodynamics and Propulsion, focusing on the development of a numerical system modeling approach for a high energy density, aluminum-water combustion based propulsion system for underwater vehicles. 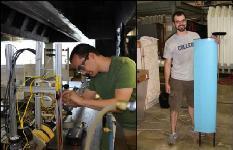 Dan's Ph.D. research is focused on modeling fuel cell hybrid systems for aircraft applications. This involves integrating fuel cell systems into gas turbine and internal combustion engine cycles in order to produce electrical power at much higher efficiencies than conventional generators. Potential applications range from small autonomous aircraft up to commercial airliners and military cargo aircraft.The sponsoring facility for Dan's award is Naval Air Warfare Center Aircraft Division - Patuxent River. Robert D. Vocke III is starting his 4th year as a graduate student in the Aerospace department?s Smart Structures and Composite Research Laboratories and is working towards a PhD, with concentration in Structural Mechanics and Composites, and Rotorcraft. He received his B.S. and M.S. in Aerospace Engineering from the University of Maryland in 2008 and 2012 respectively. Robert has two journal articles and one book chapter published on the use and design of smart materials and actuators for aerospace morphing applications. He is active in many professional societies, having presented and won awards at many AIAA student conferences, and is a three time winner of the AHS Vertical Flight Foundation fellowship, and is the president of the UMD SAMPE Chapter. Outside of school, Robert is an avid amateur chef, rock climber, caver, hiker, and general outdoorsman. After graduation, he will work with the Army Aeroflight Dynamics Directorate?s (AFDD) Aviation Advance Design Office located at NASA Ames in Mountain View, CA. Robert?s research is focused on the application of smart materials and actuators to morphing aircraft. Morphing can generally be defined as a major change in aircraft geometry, such as span, chord, camber, sweep, etc., which allows an aircraft to operate efficiently in multiple flight regimes. His early work focused on span extending wings for UAV applications using a novel zero-Poisson ratio skin and substructure. More recently, he has been maturing this technology for use on rotorcraft, specifically as a variable diameter rotor for tiltrotors such as the V-22 Osprey. Robert has also worked on the design and development of rotary actuators using Pneumatic Artificial Muscles (PAMs) for the control of trailing edge flaps on rotorcraft. PAMs, which mimic the contraction of natural muscle, have the potential to be a lighter, safer, and more damage tolerant replacement to traditional aerospace actuators.